Posted on September 21, 2018 September 20, 2018 , in Hot Tubs. When people think about hot tubs, they usually picture them outside. However, plenty of people decide to locate theirs indoors. 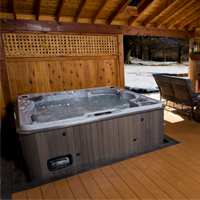 There are plenty of benefits to indoor hot tubs like climate control and privacy. If this idea appeals to you, consider these pros and cons when beginning your hot tub journey! If you have pets or small children, an outdoor hot tub can make you feel a bit apprehensive. An indoor spa offers the advantage of an easy lock you can place over the door. This way no curious children or pets will find their way into the spa. If the only outside space available for you is a tiny lawn with lots of neighbors, you may not always feel comfortable taking a soak. Indoor hot tubs can offer a relaxing spa experience that will be both personal and quiet. You can also have more control over your surrounding environment. Choose the preferred lighting, candles, music, and essential oils. Also, bathe without the worry of unexpected interruptions. If you were hoping to create a space around your hot tub that is filled with lush plants, this is still possible. Incorporate moisture-loving plants that can help soak up some of the humidity. Orchids or gardenias can provide a beautiful look. It would not be uncommon for someone to not want to enjoy a soak during the cold winter months or during a rainstorm. Indoor hot tubs offer a sheltered space that allows you to take soaks every day of the year and at any time of the day. There is also less maintenance since you will not need to worry about petals, leaves, or dirt finding their way into your hot tub water. Those with big ideas for their hot tub may easily forget, hot tubs are heavy! After filling up a tub with bathers and water it can quickly weigh thousands of pounds. Even small hot tubs can apply pressure of 250 pounds plus to the surface, it is resting on. This can be over 5 times what is recommended for certain floors. If you want to have your hot tub on a wood floor within your home, it will need a large amount of re-engineering or need to be replaced by a concrete slab. You should not only be concerned about the floors. The doors and walls of your home should have a special vapor covering. This will be water resistant to damage and keep the humidity created by the hot tub in the room. It is not uncommon for many types of flooring materials to become very slippery when wet. More water will exit your hot tub than you may first think. Up to a gallon of water can come out with your foot when exiting a hot tub. If you want to avoid accidents and prevent your floor from rotting, incorporate an anti-slip floor with proper drainage. A great option is a slip-resistant tile floor. It is crucial indoor hot tub rooms have proper ventilation. Including items like fans and a dehumidifier can help keep ceilings, walls, and windows properly controlled. It is also recommended homeowners consult with an HVAC specialist to discuss ventilation options. You are now aware of some of the pros and cons of indoor hot tubs. Continue to learn more about hot tub features by downloading this hot tub buyers guide.